Claim-construction used to be the bread-and-butter of Federal Circuit decisions. That standard was of course upset by the onslaught of eligibility decisions from district courts and BRI obviousness cases out of the PTAB. The patents at issue here all relate to circuit board construction – and dealing with the problem of delamination. The claimed solution is uses “a unique surface structure . 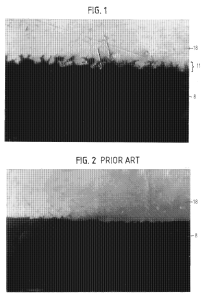 . . comprised of teeth that are preferably angled or hooked like fangs or canine teeth to enable one layer to mechanically grip a second layer.” The figure below from the patent provides an example of how the layers might fit together. Step 6, as discussed subsequently in greater detail, involves the etching cavities, veins, openings, or gaps in the applied dielectric material 8, or more particularly an outermost surface thereof, to accommodate the teeth. One technique for forming the teeth is somewhat similar to what has been known as the swell and etch or desmear process, except that contrary to all known teachings in the prior art, in effect, a “double desmear process” is utilized. During prosecution, the patentee also explained that the invention uses “two separate swell and etch steps” to form the teeth. However, the claims themselves do not expressly require the double pass process. In the first decision in this case, the district court considered the claims, specification, and prosecution history and found that the claims should be interpreted to require a double pass — even though not expressly required by the claims. Because the accused infringers only used a single-pass, non-infringement was then an easy finding. This approach here is properly seen as a patent drafting trick rather than an improved disclosure or invention. We know this because, although the specification called its double-pass approach “one technique” it did not describe any other technique — except for the prior art single-pass technique that the specification bemoaned as inferior. Still, the Federal Circuit sided with the patentee and found that the words of ambiguity sufficient to avoid a claim scope narrowing. I’ll note that this decision is an example of the rhetorical approach of disassembly. After the appellee pointed to ten different reasons for limiting claim scope, the court walked through each one individually — and concluding that each offered “mere” subtleties and not a “clear disclaimer.” The court did not consider the impact of the whole. This is an easy criticism of the court’s decision, but the reality is that the court is now in a tough position. I would have also criticized the decision if it had gone the other way (which it could have based upon an alternative statement of the case and reading of precedent). The bigger problem here is that we need to step back and repeatedly ask – how can we build up this system in ways that truly encourage beneficial innovation and do not simply encourage extensive lawyering. This case is also a clear failure of the examiner who was told by the patentee that a particular aspect of the innovation was important, but then allowed the patent to issue without requiring that it be expressed in the claims. Dennis: Did you mean dissembly? Like deceitful? I see it the other way around: The district court went to significant effort to import the best mode/enablement into the claims (whether it was misled or found its own way is uncertain). This appears to be a routine prosecution, describing how to do it without suggesting that there was only one way to do it. Though the double smear was mentioned as a way of creating the teeth, no language suggests that it was the only possible way, and no language suggested that a new single smear method was out of the question. The prior art single smear method was critiqued, not all possible single smear methods. In this aspect, the spec was well-written and not tricky (insofar as the spec mentioned THE invention, it was not well-written). The claims directed to structure, without mention of the process for creating the structure, are agnostic as to any process for creating the structure. The issue of single smear versus double smear it totally irrelevant. We should be wondering how the district court got so confused and was unable to apply basis patent law. KDC: . Though the double smear was mentioned as a way of creating the teeth, no language suggests that it was the only possible way, and no language suggested that a new single smear method was out of the question. The district court got “confused” because the patentee talked out of both sides of its mouth. The district court chose what it believed was the most efficient way to end the controversy, but it chose the wrong route. This patentee would have appealed regardless but the correct result was a broad claim construction and a tanking under 112. For reasons already stated, your desired Ends is not reachable by the proper means (even if you merely mouth those means). Have you bothered reading the case yet? Or is your standard “the patentee must be wrong” driven cognitive dissonance still unchecked? We all Bow down before You, Humpty Derpty. You’re a very serious Person! Dr. Wong’s declaration says that “two separate swell and etch steps” is A technique for forming the teeth, not the ONLY technique. He was very clear, and avoided saying what you attribute to the patentee. The claims were allowable due to the teeth, not the method of making the teeth. At least for the ‘560 patent, the arguments in the prosecution were done well, without tying the invention to any one method of making the structure. Still I don’t see dissembly in the prosecution or the appeal. Seems to me that a more apt title here would be “Failure of Examiner and Applicant to Insert Express Limitations into Claim Massively Increases Cost of Enforcement”. The bigger problem here is that we need to step back and repeatedly ask – how can we build up this system in ways that truly encourage beneficial innovation and do not simply encourage extensive lawyering. After a zillion overly scrivened g@ rbage logic claims, I have to chuckle that Dennis chooses THIS case to make THIS point. Pretty funny. This case is also a clear failure of the examiner who was told by the patentee that a particular aspect of the innovation was important, but then allowed the patent to issue without requiring that it be expressed in the claims. Yes, this was a total failure on the PTO’s part for exactly this reason. It’s an ongoing, longstanding systemic problem and perhaps Fraud Iancu should be focusing on that rather than spending incredible amounts of energy illegally coddling his worst customers. I rarely comment, but with respect to the last two sentences of this blog post, I cannot agree with the first. The lawyer is just doing his/her job, eliminating language that a court can easily hang a decision on. We routinely remove language stating “the present invention is…” for this very reason, and this decision is a reminder that this is indeed a best practice for clients. It seems there is no longer any utility to to the requirement, established in 1836, of including claims in a patent. For a time common sense prevailed and the words at the end of the patent provided meaningful notice. Now it doesn’t matter what words are used the lawyers and hired “experts” will bend, twist, and stretch them to create a dispute. Why have a Markman hearing to construe the words that are used to construe the invention? Not only that, infringers focus entirely on designing around the words rather than employing the prior art or a coming up with new invention. The whole exercise is a game to get away with using the inventors teachings via legal maneuvering. Let’s get rid of claims again and let the the judge/jury decide whether the infringer is using the teaching of the patent disclosure. Claims have outlived their purpose and exist now to feed a multi-billion dollar litigation industry. Not helping to promote progress in the useful arts. It is not often that one finds Josh Malone in agreement with Prof. Lemley on a controversial point in patent policy. Mark this day, folks. Capitulation and throwing one’s hands in the air is NOT a great day (be it “in agreement with Prof. Lemley” or not). Buck up Josh, there are plenty of us who believe in protecting innovation that have not given up the good fight. Reality is that Lemley has kicked the s h i t out of the pro patent people. He has been quicker and smarter. His talents have been focused on bu rning down the patent system and he has done a great job. He is within a few more body s t a bs of finishing off the patent system. I don’t like his tactics and believe he is unethical and motivated by to some degree personal gain, but I take my hat off to him. He has been awesome in his ability to destroy the patent system. It is always easier to destroy than to protect. Lemley has kicked the s h i t out of the pro patent people. He has been quicker and smarter. You don’t have to be that quick or that smart when you are dealing with the least credible and least quick attorneys who ever walked the planet. The patent maximalists are the earth’s supreme experts at pounding their fists but that’s about it. Oh noes! Words! People can interpret them! I can already tell this is going to be a long week. 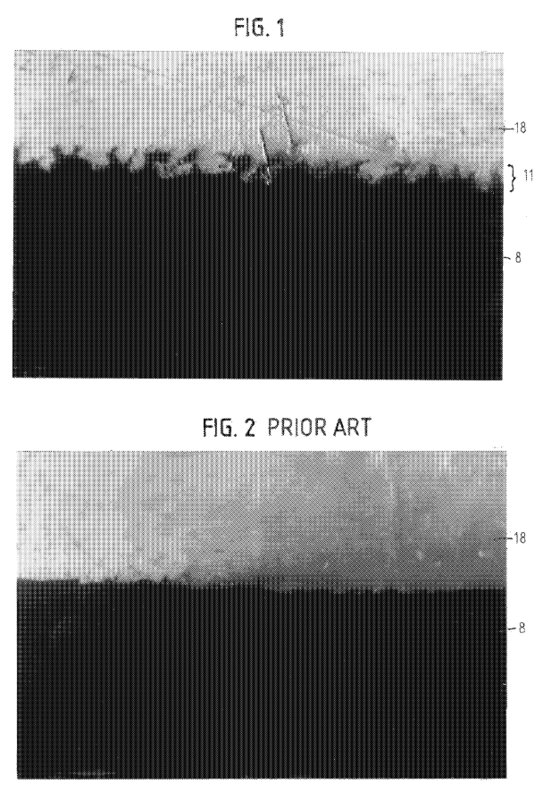 The examiner made indefiniteness and written description rejections during the prosecution of the ’560 patent of the claim limitation “etching of the epoxy uses non-homogeneity with the solid content,” which is used to bring about formation of the non-uniformly roughened surface of the angular toothshaped cavities. See J.A. 2122–23. *The examiner made a rejection to a result that simply USES material to achieve a result with no limitation how the material is used to achieve the result. * The examiner is immediately better than 75% of the patent bar, and created a record sufficient to end the case. In response to the office action, Continental submitted an expert declaration explaining that the “etching” process disclosed in the specification uses “this known Probelec XB[ ]7081 resin” and “two separate swell and etch steps” as “a technique which forms the teeth.” J.A. 2074; see also J.A. 2068–69. The district court found that the expert declaration “clearly describe[d] the patented method as involving two etching processes.” Claim Construction Order, 2017 WL 3478659, at *6. Moreover, the district court observed that extrinsic documents produced by the inventors state the use of a “two pass desmear cycle” and that “we use a double pass desmear to achieve the tooth structure.” Id. (quoting J.A. 3321, 3324). The court acknowledged that those statements were “not reliable enough to be dispositive,” but found they “provide[d] helpful corroboration.” Id. Applicant responded by providing evidence that *double desmear techniques* achieved the result. Because the claims are broader than double desmear, the patentee fails to meet 112a over the entire breadth of the scope. There is a clear undescribed and unenabled embodiment where the claims include an etching result that is made by using single desmear but the specification only describes and enables how to achieve the result using double desmear . Because knowledge of skill in the art is only a rule of supplementation, not a substitute for a basic enabling disclosure, the claims are unenabled/undescribed based on the four corners of the application. The situation is analogous to Lizardtech. That only makes logical sense – The specification continually points out that the double desmear is *important* to achieving the benefit, but in fact what the specification meant to say is that the double desmear is *necessary*; or at least necessary in the sense that the specification does not detail how to get the etching result without using the double desmear (which, for purposes of 112a, is the same thing). All defendant has to do is re-raise the initial rejection logic put forward by the examiner and explain that the withdrawal of the rejection was improper because withdrawal was based on a too-limited view of the claim scope. Intel’s litigation department owes me cookies. The claims now clearly are invalid, because they violate 112a/b. Exactly. One does not really need to get into §§102/103 (although the claims might also fail on those grounds for aught I know). In view of the CAFC decision here about claim scope and infringement, the district court has little option other than to conclude that the specification does not support the full scope of the claims, and that the claims therefore fail under §112(a). Greg, the practical problem is that statistically it is nearly as unlikely for a D.C. judge to hold a patent claim invalid under 112 [as broader than the spec. example] as it is for an examiner to reject a claim on that basis when not in the “unpredictable arts” [chemical, pharmaceutical], as here. Thus, I do not see how “the district court has little option” on that issue. Nor can 112 be raised in an IPR other than for substitute claims. I am not sure what point you are trying to make here, Paul. You 9.1.1.1 is making a statistical argument (“statistically it is nearly as unlikely…”), but statistics only tell you what is likely in the broad mass of cases, not what is proper in this case. Even if I were to grant that it is statistically uncommon for these sorts of claims to be struck down on §112(a) grounds, what of it? It is also statistically unlikely for a claim to emerge from a CAFC appeal with an acknowledgment on the record that the claims are broader than their supported scope. The relevant “comps,” then, for statistical comparison are not the broad mass of claims, but rather the claims with this sort of CAFC appeal result (likely an n>5). What are the statistical likelihoods with regard to that narrower field of comps? No good for the patentee, I suspect. You are quoting the district court as if the reviewing appeals court had not said anything on the matters. Agreed. This patent is invalid under 112. Did you actually read the case? There are a host of different claim formats, and SOME of those may be susceptible to variations of some of the arguments put forth in the comment section (and the musings of Prof. Crouch), but clearly other claims are simply – in no possible way – in violation of 112. (hint: think of your favorite ‘objective physical structure’ mantra). This case just does NOT support the anti-patent rhetoric being spewed here. clearly other claims are simply – in no possible way – in violation of 112. Nobody is saying that every claim on earth is in violation of 112. What some of us are saying is that the claim in this case is invalid under 112, for very good reasons. There is a mechanism that would solve the issue that Dennis wants solved in the manner it should be solved. You simply rule that when the specification seems to all point toward a single embodiment, but the claims are ruled to not be limited to that embodiment, the claims fail to “point out and particularly claim the invention” when they do not include language that makes it clear that they are not limited to that embodiment. The fact that the CAFC has to jump through ten hoops and disassemble to save the claims means the claim scope wasn’t reasonably clear in the first place. Boy is this the wrong crowd to say that to. The examiner has no de facto way to require “important” features to be added to an invention. In fact, I once had a case be allowed rather than go to appeal because the conference thought I couldn’t make 112a/b rejections to a claim that lacked a feature where the specification expressly said the feature was *necessary* for the invention. Besides, this logic assumes that there was a problem – The examiner probably concluded that the BRI of the etching required double desmear because of the “ten different reasons” to do so, so the examiner probably thought it was in the claims already, so there was no need to add anything. When you argue that the federal circuit got the claim construction wrong, you probably shouldn’t turn around and blame the examiner for giving the claims the exact same construction you are giving them – that’s saying the examiner is wrong for thinking like you, and you know where that logic leads. This is, of course, the ultimate reason patent attorneys exist and is largely the problem with the system. Unfortunately, the drafter in this case isn’t very good – Fig. 2 is still labelled “Prior art” right? There is still a statement that “contrary to all the prior art the claim uses a double desmear” right? So what’s the problem? As anon correctly alludes to, its possible the patentee invented something apart from the double desmear, in which case the patent should stand. Conversely, maybe the double desmear is the only thing which renders the claim non-obvious, in which case patentee is estopped from arguing it isn’t in the prior art and it’s going to come out correctly anyway. The fact that the defendant is going to have to pay a ton of money to figure that out post-filing is a consequence of the above – that the patentee is allowed to be his own scrivener and the examiner largely has no control over the issue, which is the system working as intended. Besides, whither 112b? The CAFC probably isn’t the smartest court to do this, but either the district court or the Supreme court could easily conclude that the claims do not inform with reasonable clarity. In other words – There is a mechanism that would solve the issue that Dennis wants solved in the manner it should be solved. You simply rule that when the specification seems to all point toward a single embodiment, but the claims are ruled to not be limited to that embodiment, the claims fail to “point out and particularly claim the invention” when they do not include language that makes it clear that they are not limited to that embodiment. The fact that the CAFC has to jump through ten hoops and disassemble to save the claims means the claim scope wasn’t reasonably clear in the first place. Just because nobody has developed Nautilus since it came down doesn’t mean that Nautilus doesn’t exist. 112b is not violated only when there is insoluable ambiguity – one can perform claim construction and the claim can still violate 112b. BTW, can someone explain to me why you don’t seek out the examiner in this situation? I assume the record is silent on the issue, and whether the examiner allowed the case based on a misapprehension of the scope is significantly relevant to the strength that should be afforded the defense evidence in making the clear and convincing standard, isn’t it? My understanding is they cannot be subpoenaed, but is there also a rule that they simply couldn’t be called even if they wanted to appear? To your last paragraph, there is this little known statement of the Office that examination is based on the written record, and thus, any attempt to call an examiner to explain anything not on the written record is already out of bounds. Let me know if you need a pincite to that “written record” thing. What’s your point? Let’s change the facts slightly – Let’s assume the examiner explicitly wrote “The examiner finds this claim non obvious because examiner was unable to find a double desmear process in the prior art.” That still doesn’t tell you if the examiner thought the claim needed the double desmear to be non-obvious or if that was a duplicative reason and it was non-obvious anyway. And you know what, just for fun lets see that citation. It certainly sounds like what should be the law, but you have never ceased to amaze me with your “keen” legal interpretation skills. My point is that what you want will NOT flow from the current design of the system. It will take more than just a slight change in facts to change the system put in place. I suggest that you study the system put in place a bit more prior to making suggestions. I admit that my statement is a bit hyperbolic (the rules DO provide for some limited dragging into court of examiners for the verbal affirmation of factual items only. This is not the FULL “no need” that I first indicated. [W]hether the examiner allowed the case based on a misapprehension of the scope is significantly relevant to the strength that should be afforded the defense evidence in making the clear and convincing standard, isn’t it? No, this is not relevant. It is a common misapprehension that the clear-&-convincing standard for invalidation has something to do with the examination process, but that is not correct. As Ron Katznelson shows in his i4i amicus brief, the SCotUS required clear-&-convincing evidence even before there was a patent examination process. Clear-&-convincing evidence is required simply because that is the constitutional requirement for dispossessing a person of a vested property right. An issued patent is a vested property right, and therefore the c-&-c standard applies—full stop. The examiner’s thought process during examination is simply irrelevant now. The examiner’s thought process during examination is simply irrelevant now. Oh don’t be hyperbolic. What if the testimony was he was bribed in order to allow the patent? But what I’m saying is that “The examiner expressly reviewed references A, B and C, and found the claims non-obvious over them” is an entirely different argument when “The examiner expressly reviewed references A, B and C and found a different claim scope that is not these claims non-obvious over them.” I’m not suggesting that clear and convincing doesn’t apply, I’m suggesting that the *strength of the argument and its ability to make the clear and convincing standard* is entirely based on the thoughts of the examiner. What you are suggesting is neither clear, nor convincing. You appear to be stumbling, tripping over yourself, and unable to integrate the view of WHY we have the level of presumption of validity that we do (regardless of Ron K’s correction below). Your habits of seeking out confirmation bias to your anti-patent position impairs your critical thinking abilities. Ha! Well, you have me there. I am not convinced that this would affect validity as such. If, however, the examiner were to get up on the stand and admit that she took a bribe, that would surely count as clear & convincing evidence of inequitable conduct. I am not sure why anyone would care about fighting over the validity of this or that claim at that point, when every claim in the patent would be unenforceable in any event. It’s rather rude to ask a question, be provided the answer and then pretend as if that answer did not exist. Beyond rude, such behavior also nullifies your “attempted point” here. Your explanation of my analysis in the i4i v. Microsoft brief is inaccurate. First, you are correct that the mere fact that the patent issued after examination does not control the standard of proof. Once a patent is issued, it is presumed valid (even before the PTO started examining patent applications in 1836). The Clear & Convincing Evidence standard for invalidation of an issued patent (rather than preponderance of the evidence) is not because of it being a property right. Rather, it is because the countervailing risks to the litigants of judicial error are asymmetric. Those are vastly higher for the patentee than for the accused infringer: When the factfinder erroneously upholds an invalid patent, the defendant risks the unjust loss of damage award only for his own infringement, whereas when the factfinder erroneously finds a valid patent invalid, the patentee risks the unjust loss of his rights to damage awards or license fees from hundreds or thousands of infringers or licensees. The patent holder also loses his bargain for disclosing what could have been a trade secret. The patent holder has much more to lose than the defendant in the event of an adverse judicial error. When the litigants’ risks are equal, that is, in a symmetric case where the consequences of an error in favor of one litigant are just as serious as the consequences of an error in favor of the other, the factfinder’s certainty level must not favor one litigant over the other and it need only be greater than ½ to allow a verdict for the plaintiff. This is reflected in legal determinations made under the preponderance-of-the-evidence standard. That is why infringement is proven by the preponderance of evidence because each party has the same dollars at risk—the damages judgment amount in the event of a finding for their adversary. The fact that patent invalidation undermines property rights is irrelevant — only the asymmetric countervailing risks to the litigants matter. I show in my brief, for example, that a challenge to a trademark (intellectual property right) is proven by mere preponderance of the evidence, consistent with typical symmetry of risks. In an invalidity challenge to a mark, the challenger often gains or establishes the exclusive right to the disputed mark or its likeness, effectively substituting ownership of the disputed right. The challenger’s gain (or risk if he losses) is then comparable to the right-owner’s loss (or gain if he wins). In either case they lose a property right upon a mere preponderance of evidence. By here only saying “property” and not distinguishing between property that is a Public Franchise property and property that is a Private personal property, he subtlely attempts to legitimize Oil States. Your point, while indeed being different along the lines of risk asymmetry, ALSO underplays the notion that the very item UNDER that risk asymmetry IS the property right. In this manner, the stick at that assymetic risk IS a stick in the bundle of property rights; and that is precisely why Takings law comes into play with the institution decision of the post grant review process. The situation is a bit more nuanced than either you or Greg lay out. Begging your pardon, but this is not correct. If you read my post again, you will see that the only thing that I characterized as a presentation of your i4i brief is the assertion that “the SCotUS required clear-&-convincing evidence even before there was a patent examination process.” You acknowledge that this is correct, so everything that I presented as a characterization of your brief is—by your own admission—entirely correct. As for the rest of my post, and your alleged disagreement with it, I think that we disagree less than you suppose. You say that the requirement for c-&-c stems from the inbalance in litigant risks. I say that it stems from a constitutional standard for the taking of property. These two are not necessarily mutually exclusive. Rather, the reason the constitution imposes a higher standard for the abolition of a property right (as opposed merely to the determination that the property right belongs to X instead of Y) is because of the inbalance in litigant risks. These are just two sides of the same coin. In any event, if you disagree with that last assertion, fine and well. I never proposed that this assertion was your own, however—in my 8.1.2 or elsewhere. Therefore, I stand innocent of the charge of misrepresenting your i4i arguments. To Ron’s point, your post does NOT demarcate a difference or distinction between you stating that Ron’s i4i arguments took certain view and the next paragraph OF a certain view. Your reply here insinuates that people should have read your mind and that your second paragraph was YOUR opinion, rather than Ron’s. You offered NO such indication in your post, and the better reply from you (instead of claiming that you stand innocent) would have been to apologize for any inadvertent confusion that your unclear post may have caused. The lack of clarity makes you NOT innocent, as Ron’s view is equally (if not more) plausible directly on the face of your first post. Forgive me if I failed to parse your statement as you suggested it should be parsed. In any event, I agree with you that there is an underlying constitutional principle in the allocation of the standard of proof, but it is not, as you suggest, “a constitutional standard for the taking of property” (the “takings clause” of the Fifth Amendment). Rather, it is the “due process” clause of the Fifth Amendment, which deals with more than just property. See Santosky v. Kramer, 455 U.S. 745, 745–46 (1982) (“In any given proceeding, the minimum standard of proof tolerated by the due process requirement reflects … how the risk of error should be distributed between the litigants. The minimum standard is a question of federal law which this Court may resolve. Retrospective case-by-case review cannot preserve fundamental fairness when a class of proceedings is governed by a constitutionally defective evidentiary standard.”) (emphasis added). A worthy clarification, that. It does not, however, really alter the substantive point that I was trying to make in my way 8.1.2.2.2. The constitutional standard derives from the balance in litigation risks, so whether one calls it a “constitutional requirement for dispossessing a person of a vested property right” or “countervailing risks to the litigants of judicial error [that] are asymmetric,” these are just two ways of describing the same thing. In any event, I do not see anything with which to disagree in your explanation of 8.1.2.2.2.2. Thanks for the clarification. No. Clearly they are not. That’s like saying that any one part of the Fifth Amendment is exactly the same as any other part. You are trying way too hard here Greg. Clearly, the better path is to just admit that your first post was not clear in separating two different views. When the only way to know for certain is in retrospect (witness even the observations of CAFC judges and Director Iancu as to the Gordian Knot of current (and ever-evolving and Knot-growing) contradictions), the (Common Law) law so written is Void for Vagueness. Not really. The readership of Dennis’ blog is much larger than those who leave comments. I grant you that the lesson will run off the minds of most of the commentariat like the proverbial water off a duck, but most of the readership is likely nodding in agreement. Assumes (yep, break that word down…) facts not in evidence. It’s a bit pretentious to believe that the silent masses must hew to your beliefs, Greg. I have as yet seen the prior art that is supposed to invalidate the claims be set forth persuasively that it has done so. I don’t know this art, but upon reading the record it looks like the etchings are the inherent result of desmearing a second time, and single desmearing is admitted prior art. You do not know this art. While I agree with you, this is not an illustrative case of “extensive lawlyering”. This is just basic drafting of what they invented allowing for more simplistic processes of making a product. Wow, screwed up job there. That’s hardly a super duper “care” being shown there. It’s pretty clear you can etch once and make teeth shaped protrusions. I guess it was Applicant, not patentee, who told the Examiner what was “important”. But why oh why would an Applicant write to the Examiner in those terms though? Was it to distinguish the invention from the prior art? If so, why were claims lacking that important feature not held to be invalidated by the same prior art? Either one construes the claim restrictively, to save its validity, or you don’t and it’s invalid. Or are things more complicated than that? Yes Max, many patent attorneys do like to try to retain the classic “nose of wax” claim interpretation option for patent suits, especially since most patent suits “settle” [e.g., collect $] before getting a claim interpretation that clarifies either non-infringement or invalidity. It’s not just patent applicants, Mr. negative spin. You haven’t been paying attention when I suggest that examiners do that level of work in their examinations, have you? Patent profanity – and the source thereof – need be recognized. As long as you will have courts (not perhaps, the one here), that “aim” at providing LESS protection to innovation (and yes, the Supreme Court is a supreme example), then it will be in the innovator’s best interests to HAVE the “extensive lawyering” that you would seek to diminish. Not sure I “buy” that either. Whether or not something is “important” may — or may not — impact claims (as they may be), and claims fully without ‘something important’ may well be properly allowed on their own. Agreed. This seems to me an example of the old adage “pigs get fat, but hogs get slaughtered.” In view of the CAFC decision here about claim scope and infringement, the district court has little option other than to conclude that the specification does not support the full scope of the claims, and that the claims therefore fail under §112(a). The examiner did the patentee no favors by letting them get to grant on an unsupported claim. Neither did the prosecuting attorney do the client any favors by pushing for a claim so broad, when the spec does not support it. So after all this legal expense this case now goes back for an expensive trial on 103? Would not an IPR have been advisable?